This pattern is available for FREE on my blog. The downloadable PDF listed for sale contains the full pattern (including all photo tutorials and schematics), in one printable file without advertisements. When I caught my first glimpse of Lion Brand’s new tape yarn, Rewind, I knew right away that it would be perfect to make myself a new sunhat and a tote bag! With summer quickly approaching and the sun’s rays getting hotter by the day, I decided to design a new sunhat first. The first sunhat I designed is the Stop & Rewind Sunhat. Then the Makin’ Lemonade Sunhat followed close behind when Claire asked for a new sunhat too! 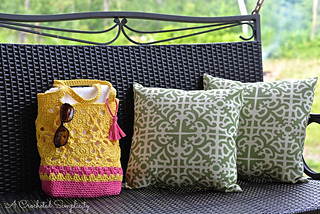 Now it’s time to share the Strawberry Lemonade Crochet Tote Bag with you. Yarn Notes & Substitutions: Lion Brand Rewind tape yarn was used for the samples in the pattern. Although it is classified as a 5/bulky yarn because it is a tape yarn, it works up more similarly to a lighter worsted/4. So keep that in mind if you’re looking for substitutions. Testers had great luck using worsted weight/4 cotton yarns such as Lion Brand Yarns 24/7 cotton and even worsted weight acrylics such as Lion Brand Yarns Vannas Choice. Bag is an A Crocheted Simplicity original design. 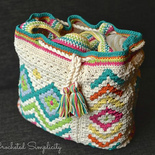 You can also find me on Etsy (A Crocheted Simplicity) & Craftsy (Jennifer Pionk). © 2018, Designed by Jennifer Pionk aka A Crocheted Simplicity. All Rights Reserved.